The problem was solved using a vibration chair developed for the Gemini program (Credits: NASA). Using inexpensive off the shelf electronics, NASA scientists devised a system to mitigate thrust oscillation from the Ares I rocket that would have cost millions of dollars to eliminate via damping. NASA has a submitted a patent for the solution, which is likely to appear in future launch systems. Advanced models of the Ares I rocket demonstrated vibration in excess of predictions for a 20 second period beginning about 70 seconds after launch. The extra vibration resulted in completely illegible displays from the perspective of seated astronauts oscillating along with their seats. “If you’re gonna fly the vehicle, you gotta be able to see the displays and controls and read what’s on them to understand what’s happening with the vehicle,” says Brent Beutter, Assistant Division Chief of Human Systems from NASA Ames. NASA’s immediate response was to find a way to reduce the vibrations. By using passive spring damping or active motor control, oscillations could be reduced sufficiently to enable astronauts to read their screens. But this direct approach would have cost millions of dollars. Instead, the scientists found a simple solution. 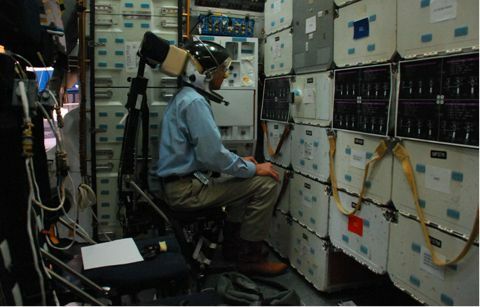 Engineers from NASA’s Vibration Lab simulated the situation using a vibration chair that was used 50 years ago for the Gemini project simulations. They calculated the intensity of the vibrations that made the display impossible to read and then started strobing the display at a frequency of 12 Hz. The solution proved to be surprisingly effective and the person sitting on the vibration chair was able to read the synchronized display. The total price of the solution was just a tiny fraction of the amount expected to be spent on mitigating the vibrations. Vibrations are inherent in all launch systems and pose a challenge for crew trying to maintain an accurate picture of the vehicle’s state. Although this study was commissioned for the now defunct Ares 1 launch vehicle, it can also be applied to NASA’s future generation of launch vehicles. NASA has also predicted terrestrial applications for the technology. Workers who rely on reading instruments in a high vibration environment such as helicopter pilots may benefit from a similar mitigation technique. In the video below, Gizmodo‘s Brent Rose investigates the strobing display solution: This article was written in collaboration with International Space University MSc 2012.